With most Australians experiencing chronic pain at some point in their lives, many will seek physical therapies to gain relief. 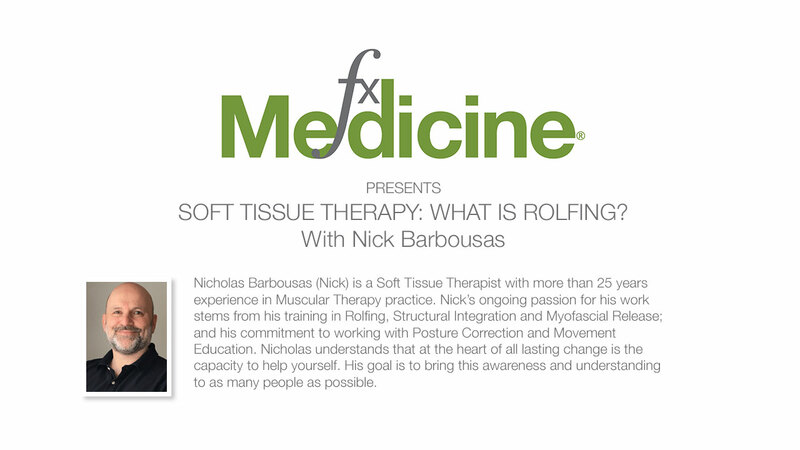 Physical therapies are an integral part of everyday clinical practice for many clinicians, and Nick Barbousas is expert in teaching practitioners about the many benefits of soft tissue therapies such as Rolfing and Myofascial Release. In today's podcast we discuss the suitability of each therapy, the conditions most often treated and the safety aspects which responsible practitioners must be aware of. This podcast is a prelude to Nick's webinar and subsequent seminar series with the Australian Traditional Medicine Society (ATMS), from June 2018. [01:40] Firstly, what is Rolfing? [03:54] How to differentiate the various soft tissue therapies? [05:56] What led Nick into his career with Rolfing? [11:26] What conditions can Rolfing be of benefit for? [15:21] The safety of Rolfing? Andrew: This is FX Medicine, I'm Andrew Whitfield-Cook. Joining us on the line today is Nick Barbousas. Nick's a soft tissue therapist with more than 25 years' experience in muscular therapy practice. 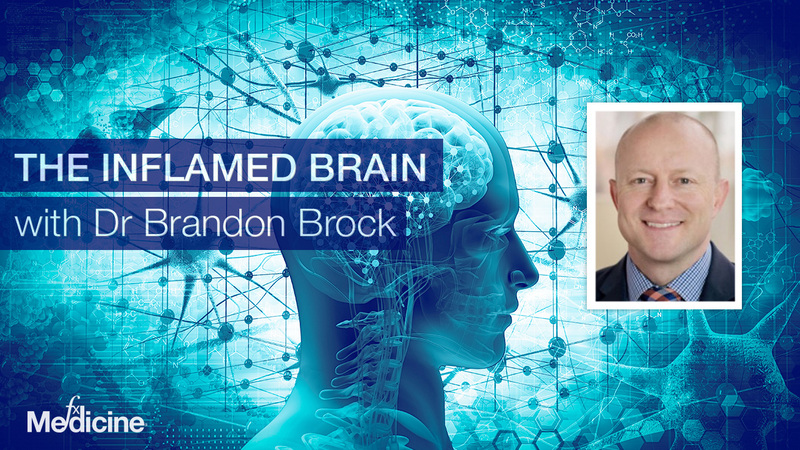 His ongoing passion for his work stems from his training in Rolfing, structural integration, and myofascial release and his commitment to working with posture correction and movement education. His particular expertise explores the relationship between our own physical environment and its impact on posture and movement. While organising and directing his own privately run mentoring hub and professional courses, Nick has overseen the development of myofascial release programs within industry institutions. 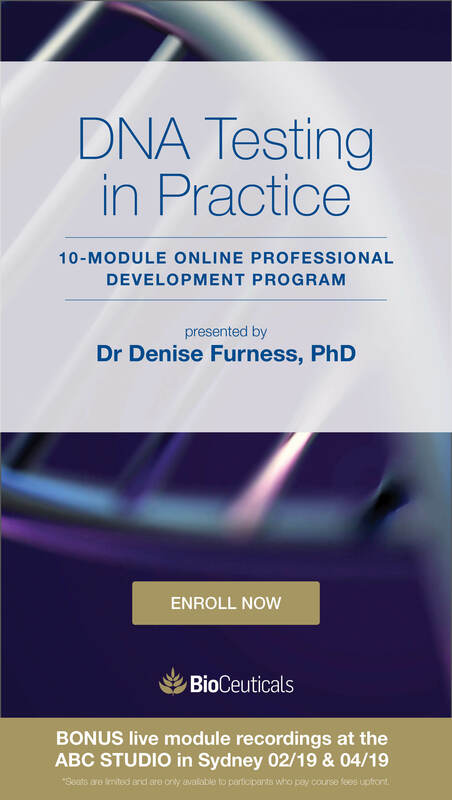 He was also the inaugural convener and co-developer of the Myofascial Release Program within the bachelor and master's degrees of Osteopathy at Western Sydney University. Nick will be conducting a webinar and subsequent seminar series from the 13th of June, 2018. Welcome warmly to FX Medicine, Nick Barbousas, how are you? Nick: I'm very well, thank you, Andrew. And yourself? Andrew: Good thanks mate. Now first of all, though, I feel quite ignorant about Rolfing. I've heard of it, I sort of think I get it, but I'm not sure. Can you clarify what exactly is Rolfing and myofascial release, please? Nick: Great, great. And, you know, I think, you know, sometimes as practitioners, we also struggle with trying to understand it ourselves, because it is slightly different for each of us. But what is at the base, what's at the heart of it is understanding our relationship with our posture, understanding our relationship with our environment, and how we are best able to work with those. Our work is heavily governed by a series of principles and practices that are structured around a series of sessions. Every session has a particular goal, a particular theme. And within each session, we work towards achieving those goals with one session leading into the next. And then the next session sort of finishing up and beginning from the that last and progressing onto the next again. The work has been around for quite a while. Dr Rolf, the founder of the work, who herself was a scientist and biochemist, started exploring some of these ideas around posture and alignment when she was dealing with issues within her own family. And a lot of her influence came from the early osteopaths. If you think back to the 1920s, which was when she was really exploring this work, osteopathy itself was only probably 20, 30 years old. So there was a real excitement about this whole notion of working with posture and understanding the human body from a whole body approach. So, this principle of holism really comes to the fore for a Rolfer as well as it does through other disciplines like osteopathy. And that's where structural integration really became the underpinning nature or discussion that Dr Rolf brought through her body of work as well. This notion that we do need to work with the whole person to integrate it, to have a more lasting long-term change. Andrew: How would you differentiate it, though, from other, a) soft tissue therapies and, b) the more hard tissue therapies like, you know, chiropractic and things like that? Nick: Sure. Really good question. You know, there is an overlap between Rolfing and, sorry, massage therapy, deep tissue massage therapy and even some of the other harder tissues therapy approaches. And so, one of the misunderstandings is, I suppose, because there is that overlap, and as a byproduct of Rolfing, some of those same goals are achieved, people think, well, it's all one and the same. Just like myofascial release is all one and the same. But, you know, for a Rolfer, the notion of the soft tissue work is only a part of it. Because what differentiates our body of work is that we really look...even though we're working potentially always with our hands, we're always looking at the greater understanding of our relationship with the segment to a whole and improving the relationship of our segments to the whole. So, creating a sense of physical balance, and really that balance is where that notion of integration comes in again for us as Rolfers. 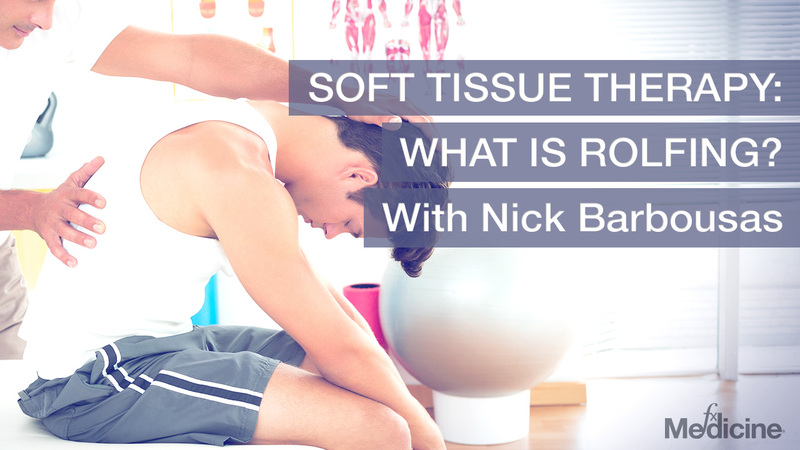 So, a soft tissue therapist, like a Rolfer, will palpate, will just try and fill for the imbalances within the tissue and the quality of the tissue, even the temperature of the tissue at times. A soft tissue therapist, like a Rolfer, will discriminate between say, fascial layers. Because, you know, myofascial release and fascia is where we come from. And so, just like most other soft tissue therapists, like myotherapy, for example, have a strong background discussion around fascial release work and using the trigger point therapy process as a means of addressing their goals. But where we do differ is that notion that, for us, it's about how we put it all together to create an integrated whole. Andrew: And what led you to follow this field as a career path? Nick: Look, it was… I've always had a long interest in the body and human movement. I think moving out of my teens into my early 20s, I had a strong interest in yoga as a form of just understanding my own… understanding of my body, I suppose, if nothing else. And getting well. And in that, I was really fortunate to have met a couple of the early teachers, as I mentioned in myotherapy before, but some of the early teachers of myotherapy in the late '80s, early '90s. And one in particular really heavily influenced my, I suppose, desire to formulate and understand how to work with a body and create change. And, you know, the notional discussion of fascia, which was really uncommon and not really spoken of highly. In those days, it was very fringe as well. Every time I did some research, the name Dr Ida Rolf always came to the front. And so, from there, I started reading her work, some of the papers she'd written. And I was fortunate enough to have met a Rolfer who there weren't many around and there still aren't many of us around, but there were fewer then. And had some work with him, and I just fell in love with it. And I literally sold everything I owned and moved to the States for two years to study it. Nick: Yeah. Well, you know, when you're young, you sort of do these sort of things that you don't reflect on too much. Andrew: Yeah. It really interests me about this sort of body alignment. How the, you know, physio, chiro, osteo, myofascial release, massage therapy, they all have to do with alignment. But there's different ways of approaching it. Is there anything that sort of integrates all of it? Nick: So… and posture. And a lot of...I don't want to sound controversial by saying this, but a lot of processes… and the advent of social media has made this a really...the platform is there now for people to say, "This is what someone looked like before they saw me. This is what they look like now after they've seen me." But what we have is a snapshot, a moment in time, we don't really have a process that’s underpinned that. So, there is a sense that people are trying to make change by working with this notion of alignment, but there isn't a systematic process that works to uncover restrictions and patterns of where there is disinformation occurring in the body, and then trying to take that out, but also, at the same time, put something better in its place. And Rolfing at its heart is all about that. Taking out but with the notion that you are putting something back in that will better suit and bring someone to a more aligned sense of themselves. And it's usually over a series of sessions, so the process itself, there is no one-size-fits-all as well. And because the work is heavily principle-based, you're able then to take someone and really filter out what is the unique characteristics, that you know, for the person in front of me? And so, you are able then to have five people in an afternoon, and treating one after the other, even doing exactly the same session within the process. And yet, every client's experience will be very different. And even the strategies you employ within that session potentially can be different as well. Andrew: There's a couple of points I just picked up on. And one is that you can't get benefit from just one session. I found this myself with massage. You know, people say, "I'll go for a massage, and all of my problems will melt away," you know? Like, for instance, I remember recommending massage, like finding a good massage therapist for somebody who had shoulders like rock, and they'd carried so much stress throughout their life. And this massage therapist worked on them not once, not twice, but several times. And over a period of a couple of weeks, the tissues were loosening, and then the person's demeanor started to brighten. And it was really interesting the changes that you can see with a person from repeated sessions. But you just can't get it from one session, it just doesn't work like that. Nick: Absolutely. You know, something I've seen consistently over a long period of time is that there is a real need for people to know that they have a responsibility for their own care and that putting a responsibility on your therapist is part of the relationship, but also being conscious and aware that it is an unfolding and unpacking process. And quite often people's story that they bring into the treatment room and onto the table has occurred over a long period of time. And as a consequence, you know, your therapist has to work with you in a way where he can help you unpack that story but also be comfortable in the knowledge that the client appreciates the fact that it's not always possible to achieve those kind of outcomes in a very short period of time. Andrew: Yeah. So, what sort of conditions do you tend to concentrate on with Rolfing? Nick: So, people come from a whole range of backgrounds and a whole range of needs and issues, they can come anywhere. Obviously, pain is a catalyst for a lot of people to seek out our work quite often. Because firstly, you know, we're a smaller community of practitioners, we don't have the exposure in Australia especially. So the information and the education of what we do is probably not as great. So, more often than not, people that have come to or who do come to seek out structural integration of Rolfing have already sought treatment or assistance from elsewhere. So, as a therapist, as a Rolfer, we're nearly always very comfortable with working with people who have come in with quite a chronic pain patterns. People who have sought help elsewhere and really not been able to find the assistance that they've needed. Quite often, it's not in the area where they thought the pain is as well. And that's a real big part of what a Rolfer does. Is because we're looking at patterns, we're not just looking at where the site of discomfort is. You know, a very famous and old quote that Dr Rolf has is, "Where you think it is, it ain't," you know? So, for a Rolfer, quite often, you may be experiencing an issue in your shoulder, but there may be a complete imbalance within your rib cage and relative to your shoulder girdle, and then your shoulder girdle relative to your neck. And that whole pattern, even, I could go even further and say the imbalance in your pelvis could be creating an instability for your rib cage. So, all these patterns are what we take into consideration when someone comes in to see us. So, to go back to your original question with the kind of people that would come to us. Chronic pain is a large part of the population. We also see a lot of people who are… a lot of athletes, a lot of people who are performance-based, whether it's through their vocation, because they're athletes professionally. Whether they're people who have a real strong desire to keep themselves well, and as a consequence, they exercise and train three to four times a week. 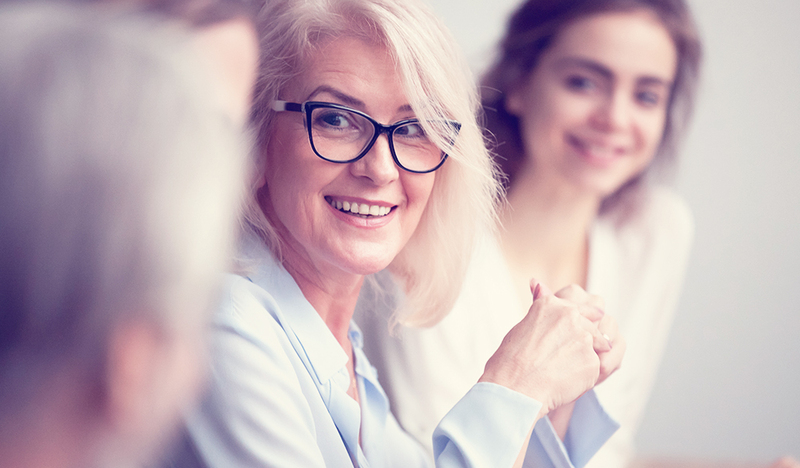 These people often come to Rolfing because they appreciate the fact that the work itself helps them to maintain and keep on doing what they want to keep doing. Which is to have a certain lifestyle choice, I suppose. Andrew: So, do you get referrals from other practitioners to say, "Look, I can do this, but, you know, physical therapies and Rolfing is not my bag. Can you look after this aspect of care?" Nick: I can only speak on behalf of myself and the people that I know around me who are Rolfers. But Rolfers get a lot of work from other soft tissue therapists and certain medical practitioners, and sometimes within certain specialized fields. Yeah, so a lot of, I'd say about 30% or 40% of my practice is through referrals from other therapists themselves. Quite often, we find there is a strong symbiotic relationship with people that work within the more movement-based therapies. Whether it is yoga, Pilates, exercise physiology… And so, there is a very close working relationship with those disciplines. And I've seen it year in, year out, when you put movement and when you put structural work together, you create a happier, healthier person. And so, there is a natural magnetic pull towards each other, I suppose that's one of a better way of explaining it, between the two therapies or the two areas. Andrew: Nick, obviously, something we need to cover his safety. I've had, indeed a friend of my wife's who eventually died, but the recurrence of her cancer was found actually by a physical therapist massaging her neck and felt a lump, and that was the recurrence from there. So, obviously, we have to think about safety. So, how well-trained are Rolfers in detecting, you know, lumps, bumps, and things that we need to refer on, and how much of a safety issue is the actual process of Rolfing? Nick: It's a very good question, Andrew. Look, like all soft tissue therapies, firstly, you know, that old maxim “When in doubt, go without.” So, as far as, you know, if we don't understand what's occurring, it's always best when you find something to refer out to a medical practitioner who is more better-suited to understand and care for that particular need and issue. But we all are governed by the same notion that our clients' care and well-being is at the forefront. And we, as therapists, as Rolfers, like all other soft tissue therapists, really take that responsibility quite seriously. You'll find most people who enter this profession do it because they have a sincere care and desire to want to be a ‘helper’, for want of a better word. But also, in our training, we've looked at how we can really assess for these kind of issues as well. So, you know, the basic contraindications that all soft tissue therapists would have to be aware of is the same for us as well, you know. And as a consequence, we do often refer out when we are not really sure of where to go with a situation. And it's a healthy and safe environment for everyone as well. Andrew: Can I first clear up one issue with me? And that is, have I got a confusion here between Rolfing and myofascial release? Are they part of the same, or are they different? Nick: A really good question and there is a real misunderstanding out there regarding...there's an overlap. So, when someone trains in myofascial release, they also think they're Rolfers or they're doing Rolfing. And I see it a lot on blog posts, I hear it a lot from other clients who have said they’ve been to another Rolfer. But myofascial release is a very powerful technique to address local myofascial dysfunction. Rolfing is a process that looks at the whole with a principle-based process, and myofascial release works within that as the tool to facilitate the process. So, it is a tool within a Rolfer's toolbox. Nick: But it's a very powerful tool. But it is not Rolfing itself. Andrew: Right. Am I correct in saying myofascial release is, you know, releasing the trigger points. So there is very often some pain involved, whereas Rolfing is not until it's a much more gentle process? Is that right? Nick: Well, so there is… trigger point therapy is a process unto itself. Myofascial release… so releasing a fascia or myofascia at a trigger point is a technique of its own. The myofascial release that a lot of practitioners are employing now is a very different approach where you're applying soft sustained pressure along a myofascial line or restriction. So, you mentioned also is it softer? Now, that depends on where the restriction is, the level of tension in that local area, and the ability for the practitioner to palpate and discriminate the fascial layers when she or he is working down to the point of restriction. Nick: And it's at that point where the art and the science of the work start to really merge a little bit. 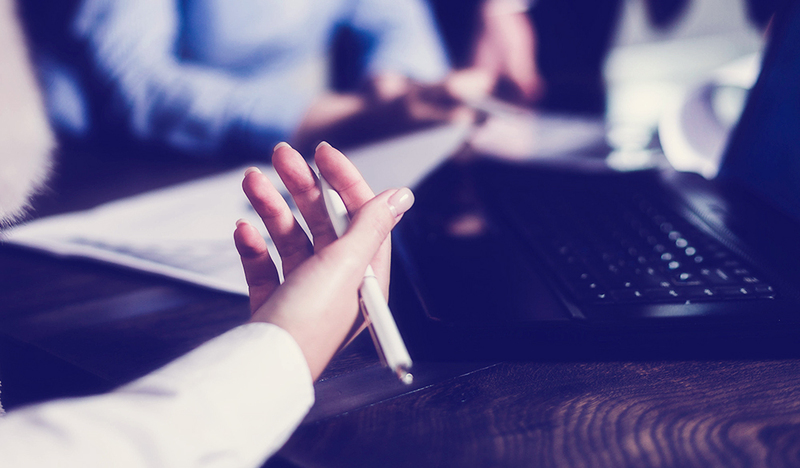 Because you do have to work with a discriminatory touch to really affect change at a pace that the client can actually take and their nervous system can take. Which is really important. Because if you can't keep them at that pace, then the chances are very high that their system will shut down a little and you won't be able to get the most out of the experience. Andrew: It's interesting you say that, because what does interest me about various physical therapists that I've seen and had work done by over the years, is that some you find have just this… I mean, it's not a knack, it's more than a knack, it's a gift. I mean, it's almost like they can feel the sinews of the muscle underneath the skin and the flow of the muscle fibres and the myofibrils, you know, if you wanted to go down that far. Very often, that can be a drain on the therapist physically, the wrists, and the arms, and the actual amount of work that you do leaning, bending over a patient all day. That can become quite draining. So, how do you look after yourself physically? Nick: That was a process over many years to really unpack the best way forward with that question. And it is a question that every therapist, every soft tissue therapist, has to really come to terms with at some point in their career. And the earlier, the better. Because, you know, the attrition rate and the burnout rate for soft tissue therapists is very, very high. Nick: The numbers are staggering actually. And it is being aware of it. I mentioned earlier that, you know, we enter into the profession because we want to help. Unfortunately, unless we consciously start to think about helping ourselves, we won't be able to maximise that capacity for us to really make any change for someone else. I personally had some challenges early on, because it was all about the work. And it was just getting in there, and the sessions were long, and all I wanted to do was just be over that table. But, you know, leaving in flexion like that over a table day in, day out has an impact. And when you're a young lad, you can do it. And, you know, I was a very active person as well, so I felt strong, and, you know, I felt, you know, like Superman in a way. But unfortunately, there is a real...you know, you're constantly emptying, emptying that tank. So, I came to a point where I had to really realise there was a cap to the number of people I was willing to work with. You have to become aware that you have to take time away from the work where you're recharging your own battery. And it usually means that, you know, you take a week off. And it's also where you're...if you're not feeling well, then it… and you're at that point where things...you're really unwell, and you can't even feel like you want to go into work. And that's the point where you say, "I've got to close my book for a day or two, and I've got to take stock again." Nick: And as difficult as it is where you've got to cancel people, I can think of at least 3 or 4 times in 25 years where I've had to do that, and mainly early on. But it is important to really start to understand your own needs as much as the needs of your clients. And I know it's a no-brainer to say it, but it's a lot harder for people to actually act on it. Andrew: Oh, so well said. Nick: And there's a discipline that's involved that I think takes a long time to really come to terms with. And I think, you know, all the other things like nutrition, exercise, rest, family time, private time. You know, time for you to feed your spirit as well. You know and not in a metaphysical sense, but just, you know, just a restorative sense. Andrew: Yeah. Now, Nick, you'll be talking at the Australian Traditional Medicine Society, that's the ATMS. You'll be doing… is it a webinar or a seminar? Nick: So, there'll be a webinar coming up in June. There will be a series of workshops also in the later part of the year in a few other states. Andrew: Yup. What will you be teaching? Without giving too much away, what will you be teaching at your seminars and webinars? Nick: Sure. The webinar itself is just a discussion around the basic principles of the subjective process of posture screening. See, what is the backbone for a Rolfer's ability to assess the posture and then work within our model to affect and facilitate change to that posture to create more of an aligned person. And in that alignment, there is more ease of movement, quality of movement, even that sense of well-being can at times come from that as well. So, the webinar is just an introduction, it's a taste of what's involved in working with a whole body myofascial release approach to soft tissue therapy. We'll look at some of the areas that challenge a lot of therapists in the subjective part of the assessment process as well. Andrew: So, Nick, where can practitioners if they're interested in learning more about Rolfing, where can they find out more resources and indeed look at learning how to Rolf? Nick: Great question. So, the first place, I suppose, is the website over in the U.S., which is where the governing school is. Which is rolf.org. We have a local page here, which is rolfing.org.au. Which also has a list of practitioners within Australia and actually some in Southeast Asia as well. And it gives you a bit of a background about the work. But the main website, rolfing.org.au, is probably the best way to go, it's quite comprehensive. Andrew: And what about people who wish to register for your event with ATMS, where can they learn more about it, where can they register? Nick: Registering is via atms.com.au. Just scroll down to events. And if you search my name, Nicholas Barbousas, I'll spell the surname, B-A-R-B-O-U-S-A-S. If they follow that process, they should be able to find the webinar. Andrew: Fantastic. Nick, I think this is going to be enlightening for a lot of people. You've really opened up what Rolfing is to me and clarified some discrepancies that I thought it was, that it's not. So, thanks for clearing up those and taking us through what Rolfing is and what it can do for patients, not just in pain, but also helping with their alignment. Thanks so much for joining us on FX Medicine today. Nick: Thank you, Andrew, it's been a real pleasure. And I appreciate the time to discuss something that's really important to me and to a lot of other people out there. Thank you. Andrew: Well done. This is FX Medicine, I'm Andrew Whitfield-Cook.